A photo is worth 1,000 words. 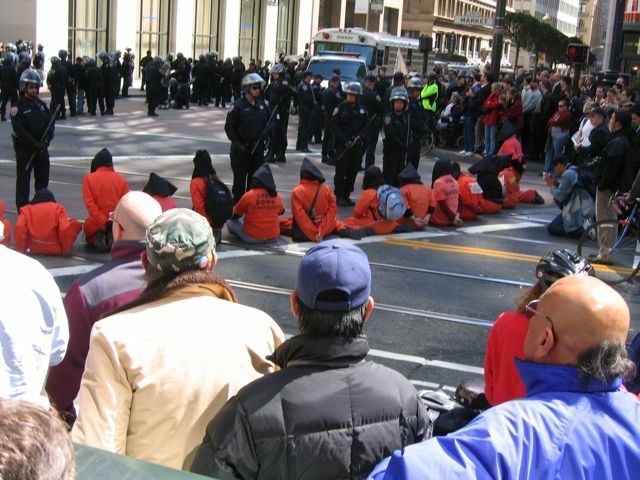 Protesters get arrested while dressed up in Gitmo jumpers and hoods. I saw one SFPD shaking his head in disbelief or disgust over having to stand there for the amazing photo op. Who is the monster here? 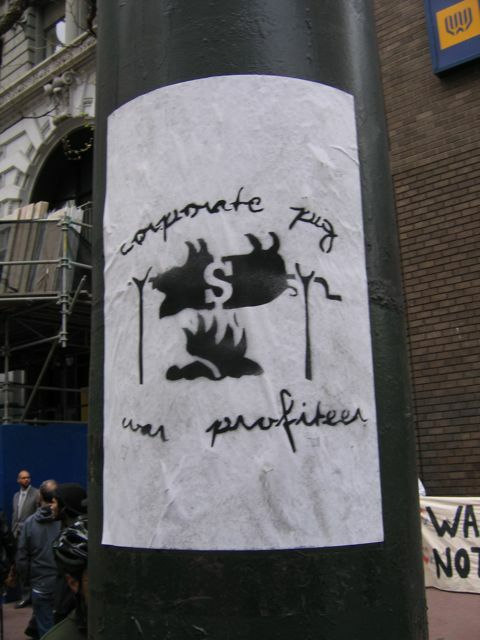 The Police State eating off of the Agro-Buisness Fast Food State? The War? The Bush Administration? Getting a look from a hired security guard, I snapped this photo on Market St. Heard later that he guy who threw the xmas ornament full of paint got quickly arrested. 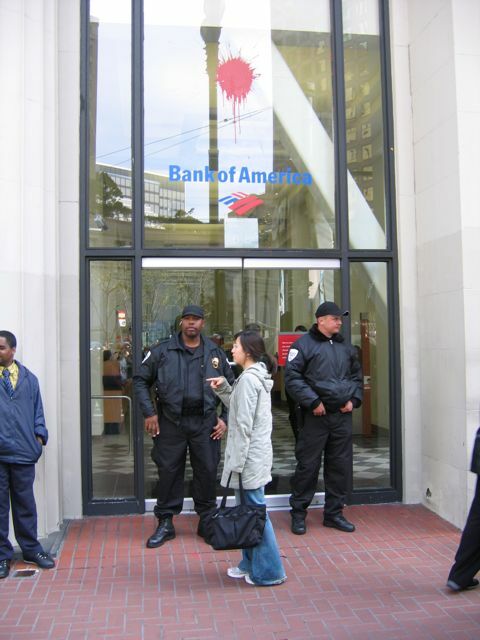 Also heard that this security co. that BofA hired have been union busting for decades. Decked out my bike with a nice stencil flag for the 11AM run down Market St. Surprisingly, the ride started doing circles in the intersections, mucking things up, from 3rd to 5th Streets. The SFPD handedly ended the fun by running into the circle and grabbing bikes. I was a block away, a black sheep who wanted the ride to go into SoMa and tie up things around the freeway. 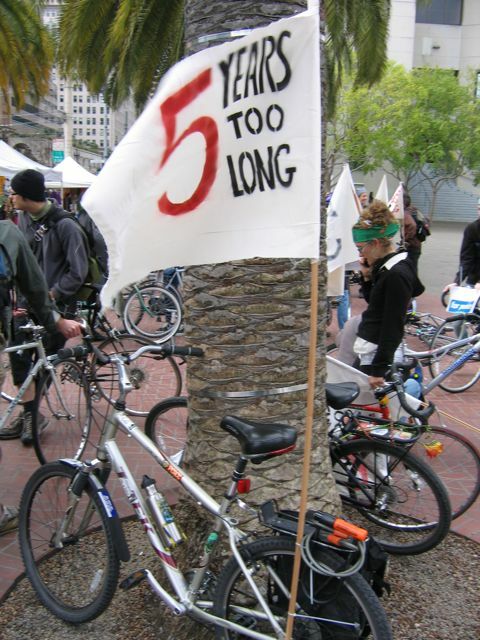 By the time I showed up to 5th St., the SFPD were in the intersection and all the bikes were on the sidewalks or rode away. 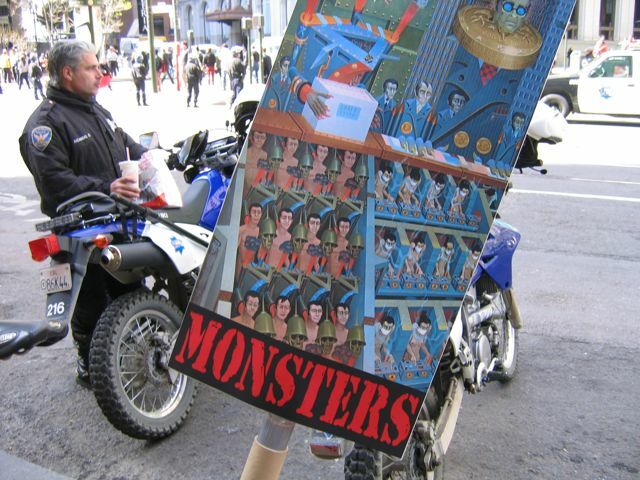 In the midst of direct action, with SFPD all over the place, some brave soul wheatpasted this poster on a pole. The poster pretty much says why we all were down there raising a ruckus.